—or, What I Learned While Writing This. In its pink and white coloring the villa shows to the best advantage from the gardens, the semi-circular flight of steps which lead up to the vestibule under the open terrace being rather imposing. But it has a desolate look; the plot of ground immediately in front is being dug over for future laying out, let us hope, of beds gay with flowers. The wide and numerous steps seem to want a few peacocks to strut about and spread their gorgeous tails in the sun. On ascending the steps, the vestibule and large oval hall on the ground floor, which is appropriated to the Khédive's own use, have something of past royalty about them. Faded frescoes adorn the ceilings, and the walls are decorated with handsome stucco work. Four inner windows, with gilded balconies, open into the hall from the rooms slightly elevated above it, to which, on each side, leads a flight of marble steps. But most of the rooms look vulgar by reason of the gaudy papers, with a pattern of trellis-work, flowers and leaves, which line the walls, and the ex-Khédive has not launched out into expensive furniture, for it is still said that he hopes to return to Egypt or the East. I heard that the first floor, which will be occupied by his wives, is to be furnished from the royal palace in Naples. This floor is the best in the villa; and, beyond the entire closing in of the open terrace toward the garden by green persiani, I saw no particular preparations for the seclusion of the royal ladies, while, on the contrary, the lofty windows of the ground floor (you must understand that this is not really on the level of the street, there being kind of a half-story beneath for offices and cellars) have been barred from top to bottom by ornamental iron-work, which has a rather prison-like effect. Everywhere bathrooms and comfortable lavatories have been made, but the usual basins, with hot and cold water taps, are all placed at such a short distance from the ground that it is evident the person washing must either sit on the floor or a low cushion. The reference is to Isma'il Pasha (1830-1895), the khedive (image, left), the governor, of the Ottoman province of Egypt from 1863 to 1879. He modernized Egypt greatly but also ran up the debt enormously, such that under British and French influence the Ottoman sultan deposed him in June of 1879. (Apparently the first indication came when Isma'il got a letter from the home office in Constantinople (I know—"It's Istanbul, not...")* addressed to "the ex-khedive"; that is handwriting on the wall—writ large.) He was permitted to go into exile in Naples and then eventually to return home to Constantinople. He died there and was later interred in Cairo. The Ottoman Empire died in WWI. I had to find that villa! (Alas, I am drawn to "wives and royal palace" like a moth to flame.) The problem with finding villas in Naples is that every time the property changes hands, the name of the villa changes. The villa in question is the white building at water's edge in the photo at the top of this page (and seen here on the right from a different angle). It is just up the Posillipo coast from Mergellina. Although many of the buildings set in the still wooded area of that part of the coast have gone up in the last 100 years, most of the villas along the water are older. This one sits on the site of the original 17th-century palazzo of Oratio d’Acunto. In 1842, the property passed into the possession of an English woman, Louisa Dillon, styled the “Marchesa di Salsa.” It was then called the Rocca Matilde (after Dalton's daughter). (After the khedive, Giuseppe Garibaldi stayed there for a few weeks in 1882 and Richard Wagner was considering it, although he eventually chose the nearby Villa Doria d'Angri for his residence in Naples.) The property passed to an English naval engineer, George Wightwick Rendel in 1883, who carried out extensive renovations, including the addition of a small, picturesque harbor. It was then called Villa Maraval. The property passed to an Irish shipping magnate, William Pierce, in 1909. At that point the building became Villa Pierce and is still referenced by that name in some sources about Posillipo. The villa was bought by the shipping magnate, Achille Lauro (future mayor of Naples) after WWII and became Villa Lauro. The premises have since undergone various episodes of restoration and subdivision and are now generally referred to, again, as Rocca Matilde. The quiz question. If they ask you "What opera by Verdi was premiered in Egypt for the opening of the Suez Canal" and you say Aida, you lose. That is a common belief, but it's wrong. The khedive was running Egypt in 1869, the year the canal opened. He commissioned the building of a new opera house for the occasion; the work performed for the opening of the theater (and the canal) was Rigoletto. True, Verdi's Aida was premiered in that same venue, but not until 1871. The theater was destroyed in a fire in 1971. The villa Maraval is still there, however, and apparently thriving. You can rent the place for your marriage at a cool nine-thousand euros for the day. That just gets you in the door, though; I think there's a surcharge for extra wives. *"Mairzy Doats" by Milton Drake, Al Hoffman and Jerry Livingston © EMI Miller Catalog. 1943. *"Istanbul (Not Constantinople)" by Jimmy Kennedy and Nat Simon. 1953. De Fusco, Renato. 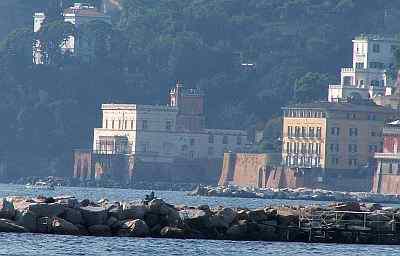 (2003) Posillipo. Electa, Naples. The New York Times. (Nov. 5, 1879) "The ex-khedive's Neapolitan Villa." Viggiani, Domenico. (1989) I tempi di Posillipo. Electa, Naples.